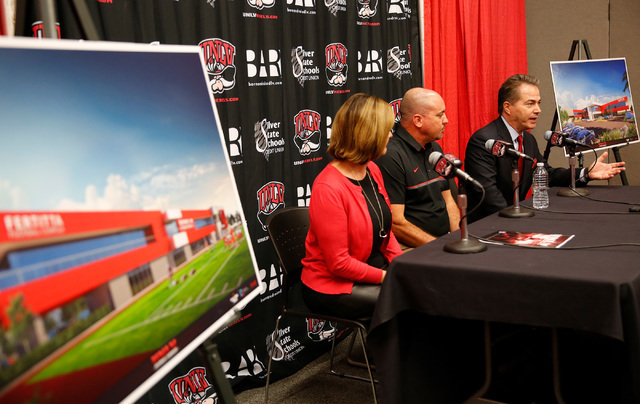 In a time when bells and whistles of extravagant and opulent levels define the arms race within college football, UNLV on Tuesday took a gigantic leap in terms of relevance and commitment to success in announcing the single largest gift in program history. He had just finished teaching a special education history class at California High in the spring of 2009 and was surrounded by several dry erase boards. On them were questions — along with his answers — he expected to be asked when the conference call began with the folks from a school called Bishop Gorman in Las Vegas. There was a head football coaching position open, and Tony Sanchez had, every now and then, thrown his name into the hat for such opportunities. The interview lasted 45 minutes, and after it, Sanchez thought it best to Google the names of a few gentlemen who were on the call and obviously important members of the hiring committee. So he typed this into the search engine: Frank and Lorenzo Fertitta. “You immediately go, ‘Wow, these guys are pretty important people,’” said Sanchez, now UNLV’s football coach. “But it might have helped me going in that I didn’t know anything about them or Bishop Gorman and it became just a regular interview. The friendship that in many ways helped Bishop Gorman elevate itself to a national prep power has now aided UNLV’s program in a manner whose long-term benefits can’t be clearly stated, only to confirm this: The Rebels are no longer on the sideline when it comes to a significant commodity in a world of haves and have-nots. They’re finally in the game. 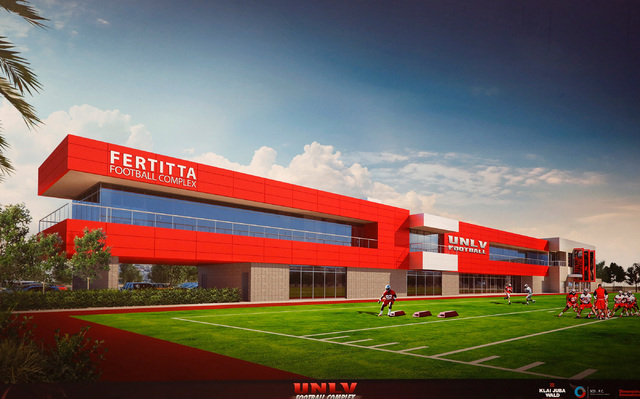 The Fertitta family has pledged $10 million toward the construction of a state-of-the-art football training facility, a building expected to cost $24 million to $26 million that will be known as the Fertitta Football Complex. 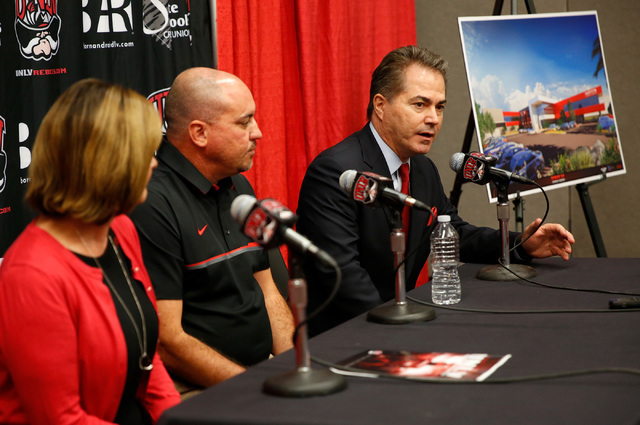 The family’s gift means UNLV has now raised $16 million toward the final price tag and expects to break ground in early spring. From there, completion would take 10 months on a structure that will include an academic center, strength and conditioning center, locker rooms, coaches offices, meeting rooms, players’ lounge, team theater, media room, training table, nutrition bar, sports medicine center and, yes, a barber shop. 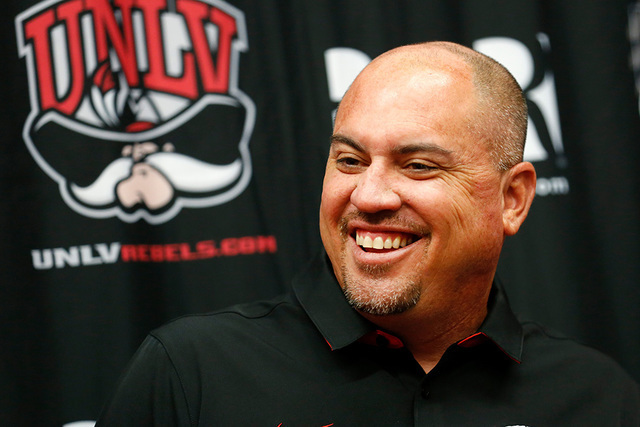 “Always recruiting,” said Sanchez, in his second year at UNLV. This is about UNLV deciding who and what it wants to be in this age of expansion and talk of super conferences while convincing members of the community to trust in Sanchez’s vision with their wallets. 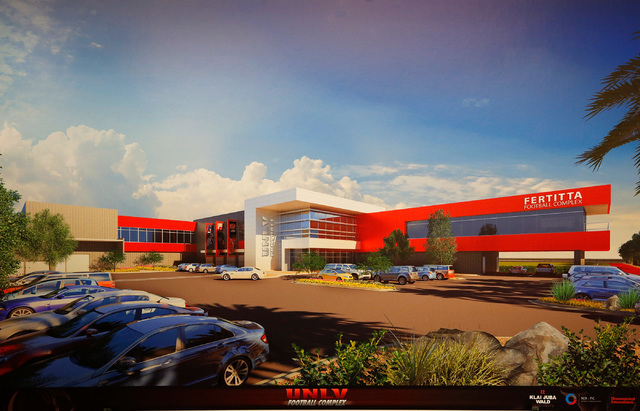 The facility — all 73,000 square feet of it that will be built in the north end of the team’s practice area at Rebel Park — won’t guarantee UNLV will win big consistently or challenge for league titles annually, but it would have no chance of doing so without it. Not in 2016 and beyond. Not in this specific area of the arms race. 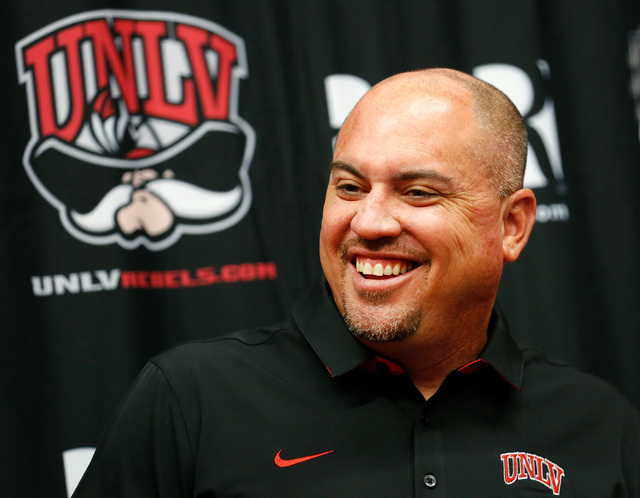 “We believe in the future of Rebel football under Tony Sanchez’s leadership and are proud to join others in helping make this vital building block for the program become a reality,” the Fertitta family said in a statement. UNLV was one of many schools recently informed it wouldn’t advance in the process for possible Big 12 expansion, and while facilities such as the one the Rebels will now build for football certainly isn’t the main piece for such Power 5 inclusion, a lack of them tends to portray your program as unworthy. Sanchez has this thing for diamonds in the rough. Cal High hadn’t been to the playoffs in its three-decade-plus history when he arrived, and four years later was meeting Bay Area power De La Salle in the section final at the Oakland Coliseum before 18,000. Bishop Gorman was a state championship-level program when he was hired as coach, but not a two-time defending national champion it is now, complete with the type of facilities many colleges lack. UNLV absolutely presents Sanchez’s toughest challenge, a program that has played a starring role among the bowels of defeat and underachievement for more than 20 years. A building won’t change that overnight. There are far more parts to the solution. “I can’t say how thankful we are to the Fertittas,” Sanchez said about the brothers who in July sold the Ultimate Fighting Championship for a reported $4 billion. “And also to everyone else who have helped us raise what is now over $16 million. We’re not done. We still need help from the community to finish this. Who’s in? Who is going to jump in the boat with us? “This is a very humbling day. It’s one thing to have a vision. It’s another to have people step up and help it become reality. This will be here long after I am gone and we are all gone. 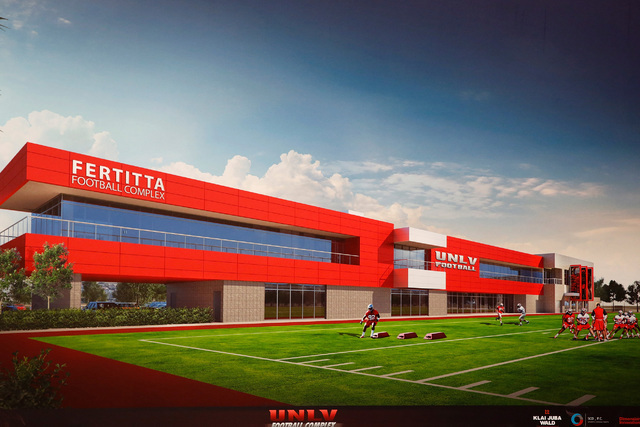 This building will take UNLV football to a whole other level. From a Google search in 2009 to this.